Around here, it wouldn't be Christmas Eve without this cake! To bake this cake, you will need a 15" x 10" x 1" jelly roll pan. 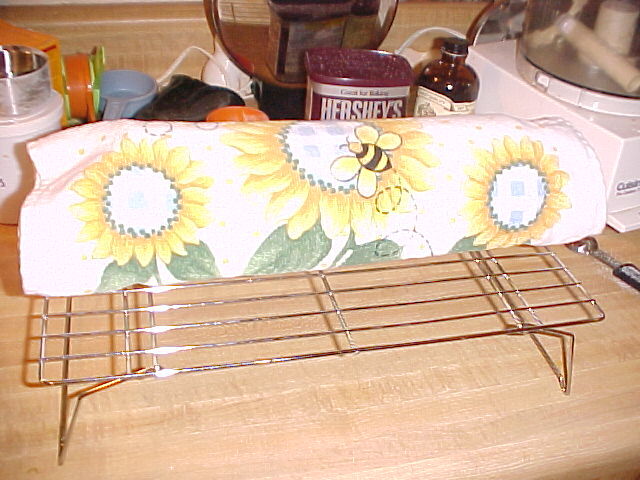 Remember: if you are the owner of a jelly roll pan, you must protect it from harm. 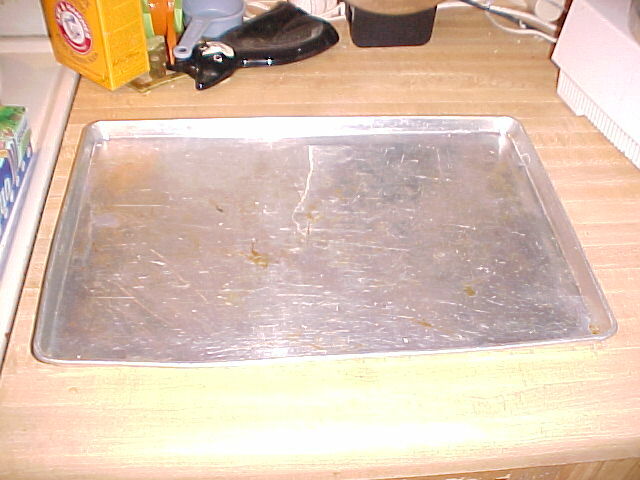 Do not allow anyone to use it as a cookie sheet, do not use it for pizza. Save it for your jelly rolls and cake rolls and it will reward you. I wash mine by hand so that it stays in perfect condition. 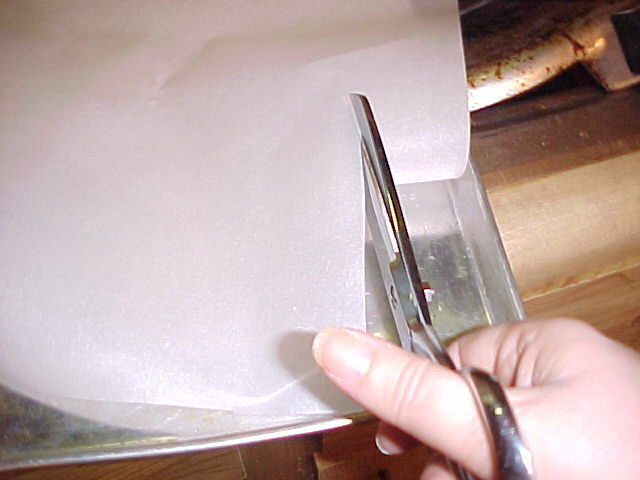 Cut a sheet of parchment paper or waxed paper to fit the bottom of your jelly roll pan and line the pan. 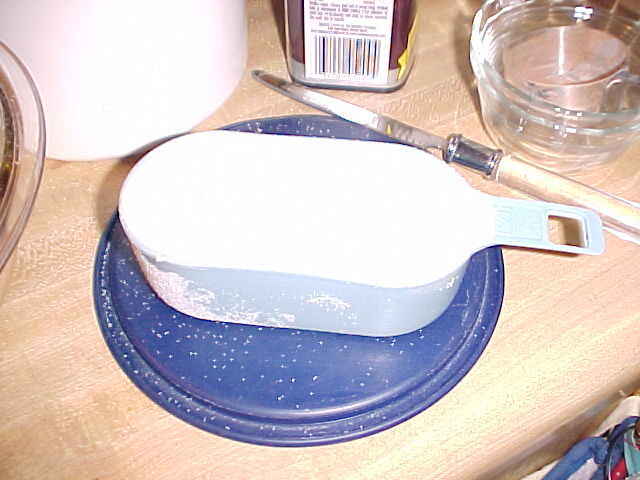 You need to grease and flour your lined jelly roll pan. 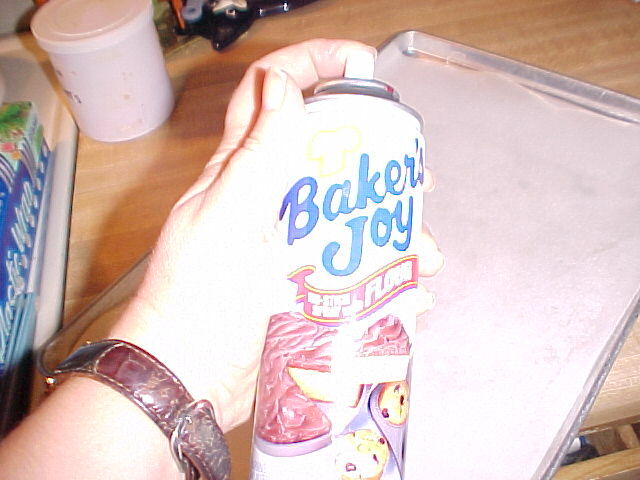 I recommend Baker's Joy spray for this -- it is a spray that already contains the grease and flour and is a sure-fire way to completely coat the pan so that your cake pops out perfectly every time. When you really need your cake to come out of the pan without sticking, this is a big help. 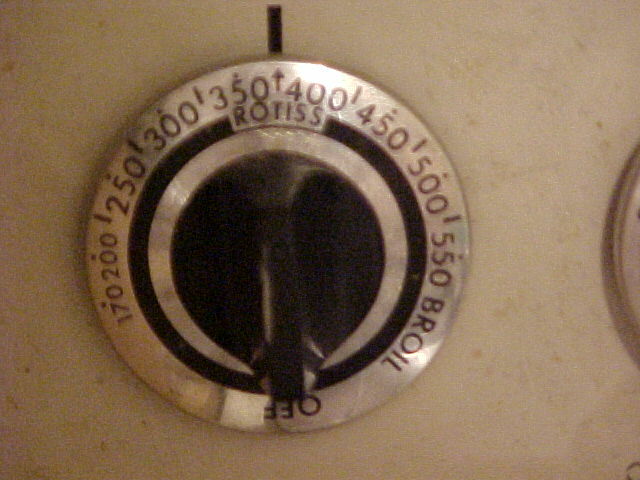 Measure 3/4 C. of flour, 1 tsp. 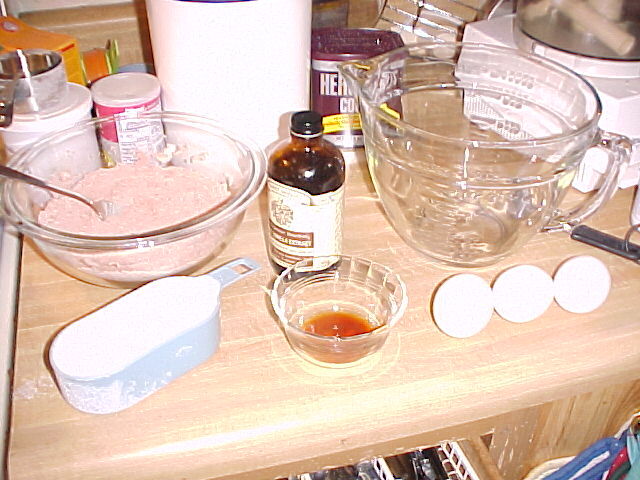 of baking powder, 1/4 tsp. 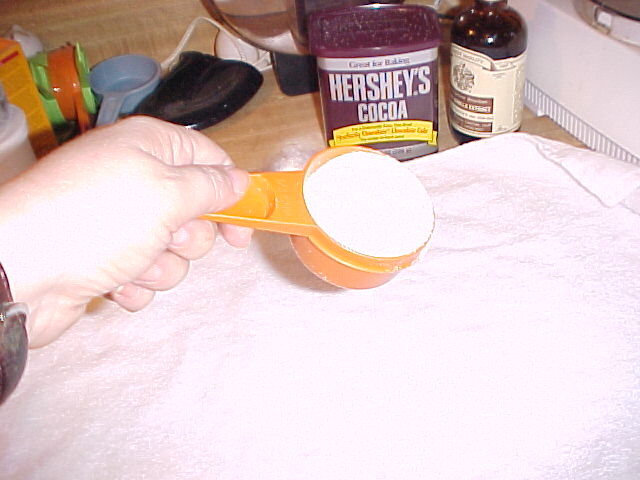 of salt and 1/4 C. of cocoa and combine in a small bowl. 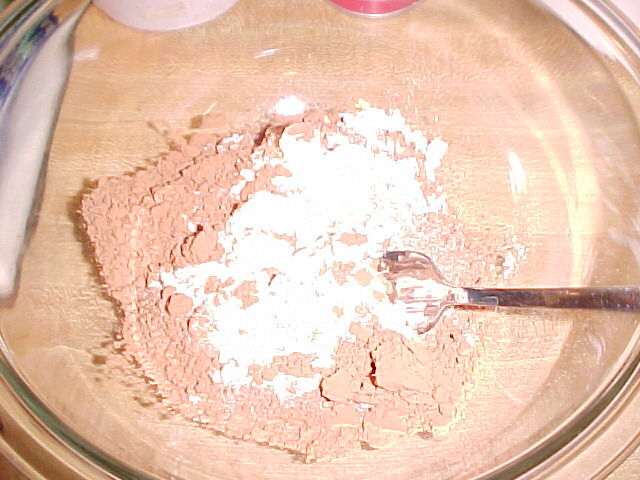 Stir together the flour, cocoa, salt and baking powder in a small bowl and set aside. 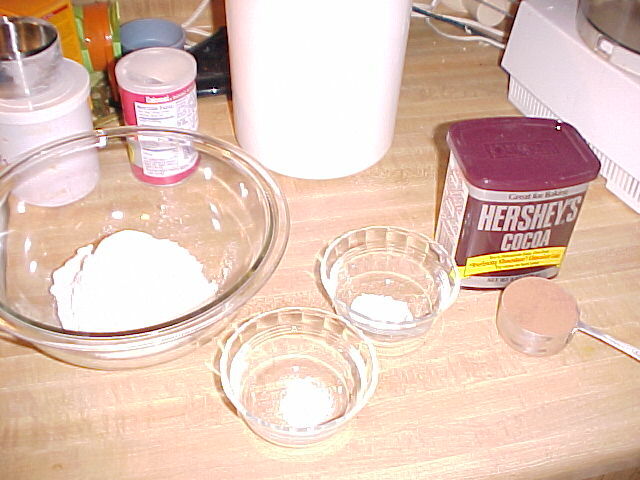 Measure out 1 C. of Granulated Sugar and set aside. Once you've measured out your ingredients, you will need 3 large eggs. 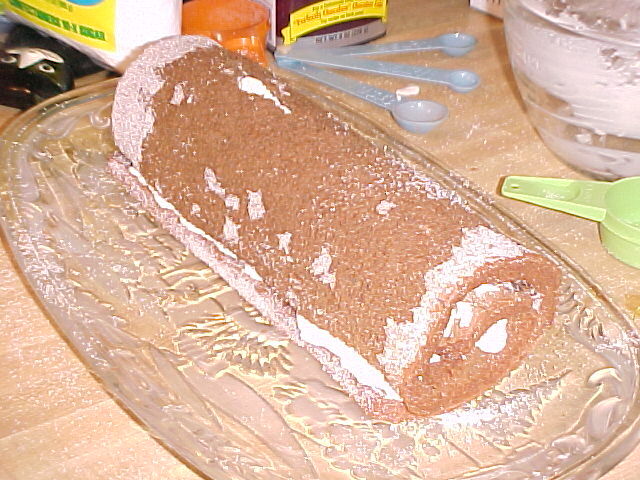 Jelly roll and other roll cakes are primarily a sponge cake and are dependent on the eggs for a large part of their leavening. You will need to whip the eggs for a full five minutes on high speed. 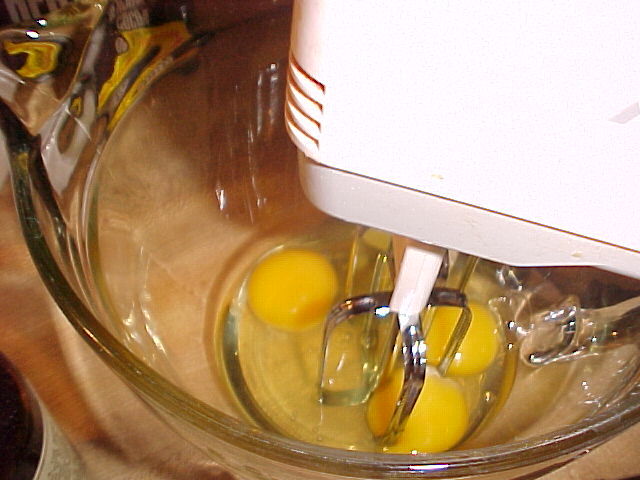 After 5 minutes of whipping, the eggs will be fluffy, thick and lemon-colored. Gradually beat in the sugar, water and vanilla. 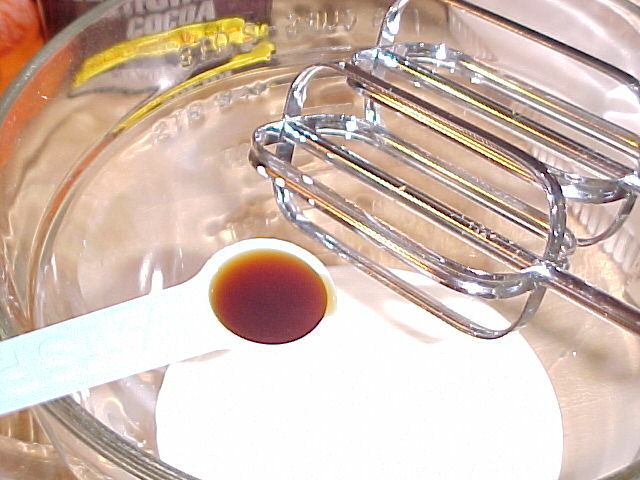 Gradually beat in the flour and cocoa mixture, beating only until batter is smooth. 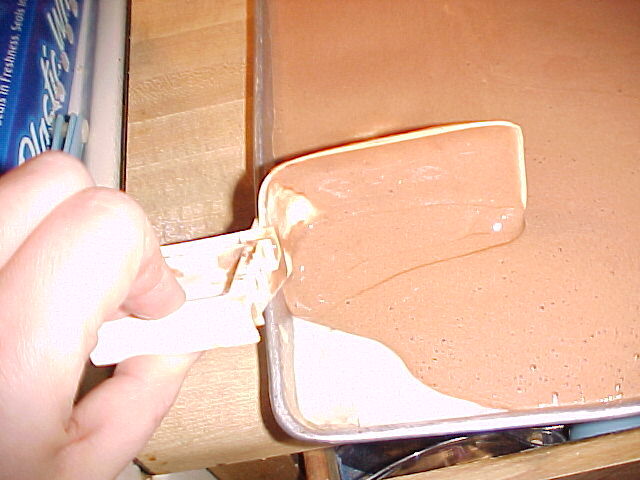 Pour the batter into the prepared jelly roll pan. 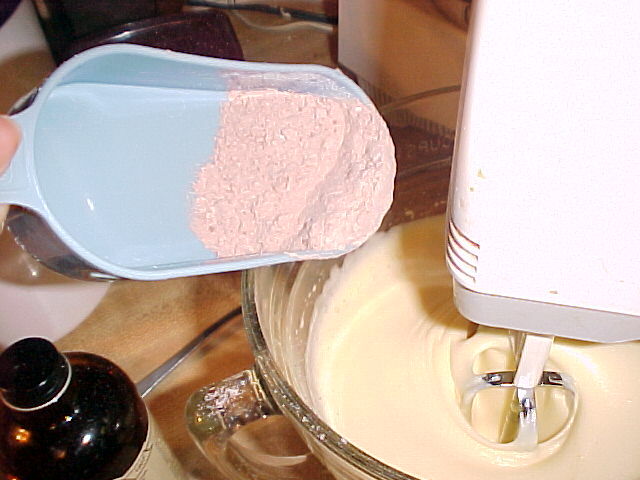 Spread the batter evenly in the pan, taking care to extend it evenly into the corners of the pan. 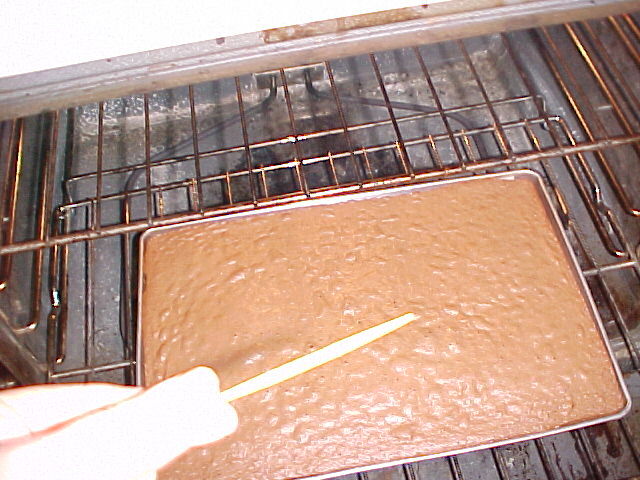 Bake at 375 degrees for 12-15 minutes, until a wooden toothpick inserted into the center comes out clean. Spread out the clean kitchen towel, sprinkle with the sugar. You will need to invert the cake pan onto the towel and remove the pan. . (Note: Before inverting, if it seems to be stuck to the edges, be sure to cut all along all the sides with a sharp knife to loosen). 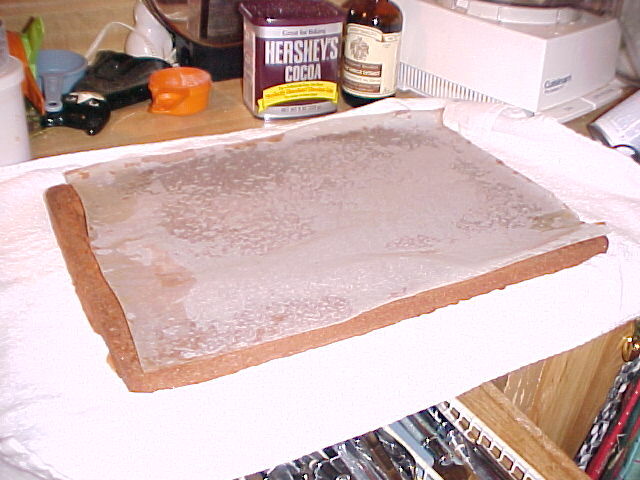 Remove the parchment paper or waxed paper. 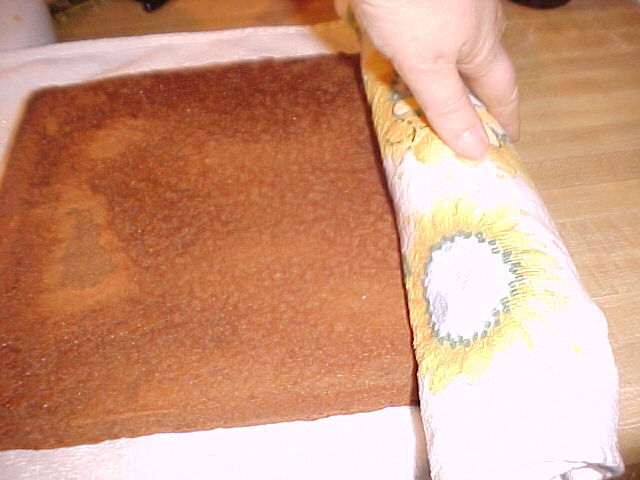 Then quickly roll the cake up in the towel from the narrow end while it is still hot. 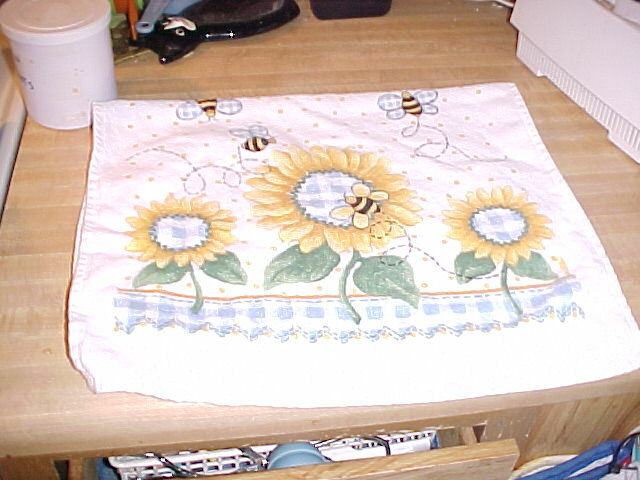 It will cool inside the towel which will keep it nice and moist. Quickly roll the hot cake up in the towel from the narrow end. Cool the cake completely on a wire rack or baker's rack if you are lucky enough to have one. 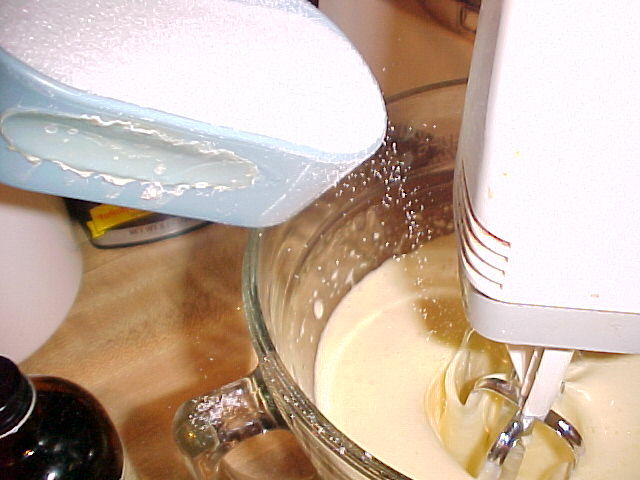 Be sure to whip the cream till it forms stiff peaks but stop whipping once you reach that point -- too stiff and it becomes BUTTER. You don't want that. 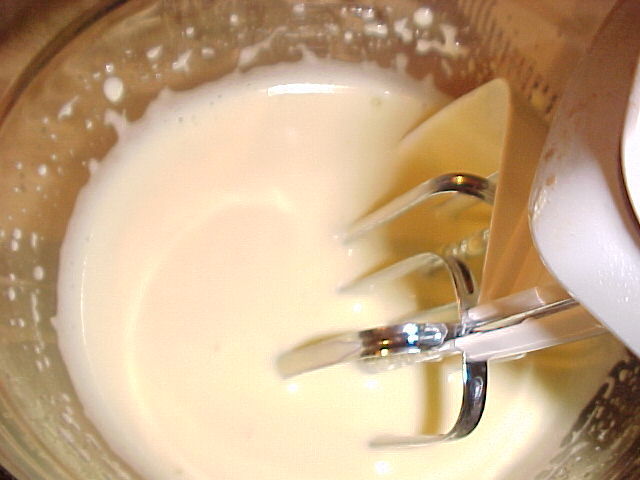 Watch for stiff peaks and make sure all the cream is evenly whipped. If part of it is "soupy", keep whipping. I find it works well to move the mixer around and not stay in one spot in the bowl all the time. 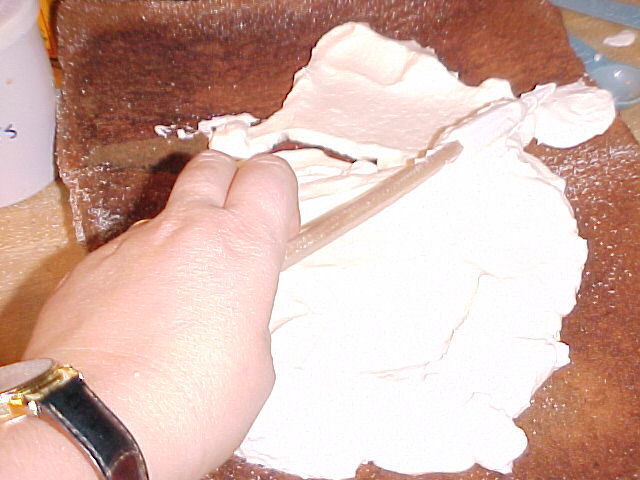 Unroll the cooled cake onto your very best cake plate or Christmas platter and spread the whipped cream onto it evenly. Roll it up. If you have a crack or two in the cake, don't panic, you'll be covering it with more cream and no one will know! If the worst came to worst and it broke into sections, you could still assemble it and ice it without anyone really knowing. 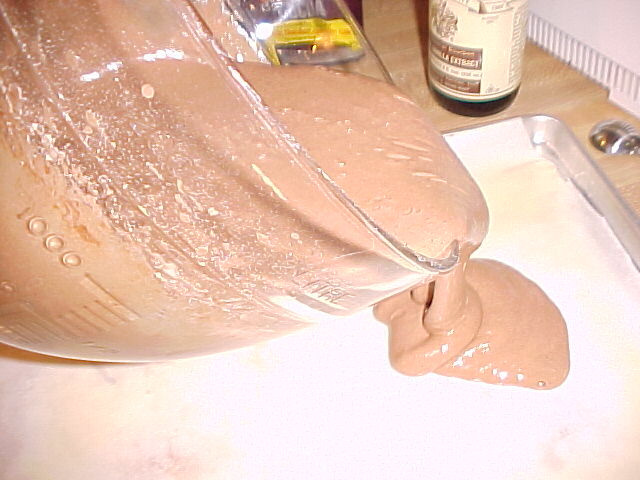 Once your cake is rolled up and filled, whip the second half pint of whipped cream with cocoa added and the sugar increased to 1/3 C. Again, make sure that the cream is stiffly whipped. Feel free to taste it and adjust the sweetness or add tiny bits more cocoa powder if you want it richer. 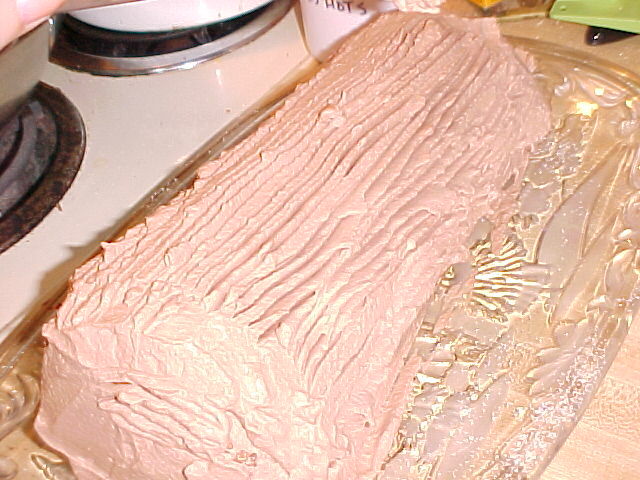 Ice the cake with the chocolate whipped cream and then drag the edges with a fork for the look of "bark" on your log. 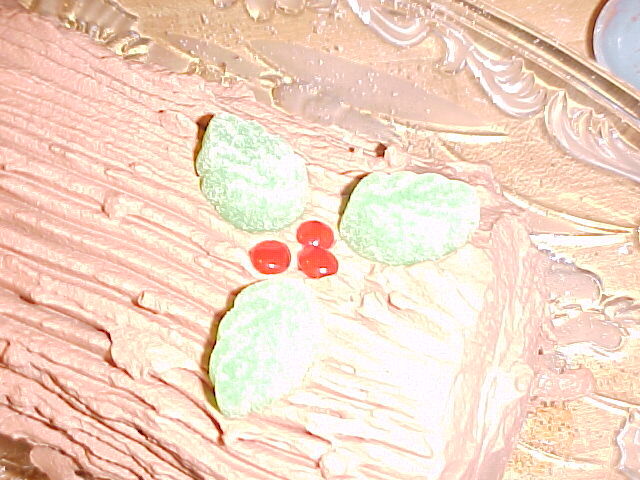 To make a holly and berries design on your cake, place 3 cinnamon red hots and then surround with three spearmint leaves. Use red licorice whips as vines. Garnish with a few extra spearmint leaves along the edges. 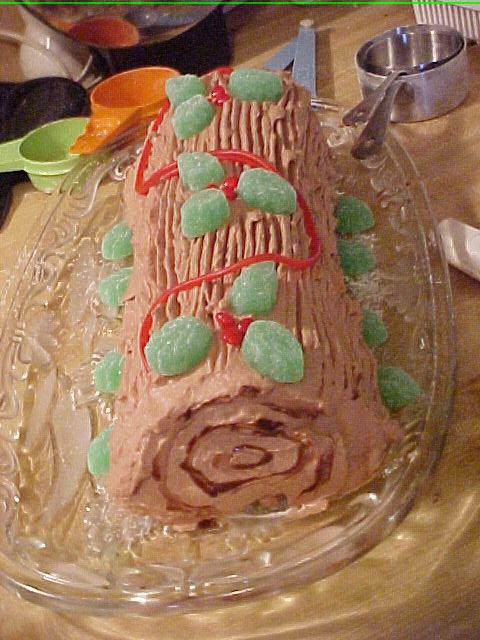 To make the log look more realistic, dip a sharp knife in chocolate syrup and paint a few rings on the ends. Keep refrigerated until ready to serve. Here is the finished cake -- the start of your Christmas Eve tradition. If you make this once, your family will want it again and again!